Hierro was born in Vélez-Málaga, Province of Málaga. After beginning his football career at local club Vélez-Málaga, he had a very brief youth spell with neighbouring CD Málaga, where he was told he was not good enough for the sport, which prompted a return back home.He eventually made his La Liga debuts with Real Valladolid, being bought by Real Madrid after two solid seasons. At Real, Hierro scored seven goals in 37 contests in his first season, and eventually had his position on the field advanced, by then coach Radomir Antić, continuing his good performances with the addition of goals - in three seasons combined, he scored an astonishing 44 league goals, 21 alone in 1991–92, a career-best. During years, he often partnered club great Manuel Sanchís in the centre of the defense, being instrumental in the conquest of five leagues and three UEFA Champions League, and being named captain after the latter's retirement. 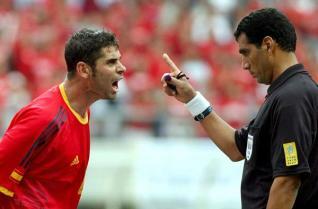 On 24 March 2002, Hierro scored a hat-trick in a 3–1 home win against Real Zaragoza,Although the ultimate leader would be Valencia CF. He was released at the end of the 2002–03 season, alongside club manager Vicente del Bosque.